Northern lights over a glacier in Iceland. Iceland (Ísland in Icelandic) is a volcanic island country situated just under the Arctic Circle. 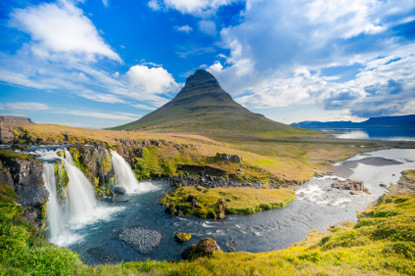 Slightly larger than Hungary or Portugal, Iceland is the least populous sovereign state in Europe, with a population of only 320,000 (less than Malta or Luxembourg). It is by far the most sparsely populated country in Europe (3 people per square kilometres). Only 20% of Iceland is considered habitable. Most of the interior consists of sand and lava fields, mountains and glaciers. 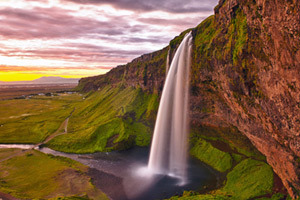 This great wilderness is a paradise for nature lovers, particularly bird watchers (puffins, northern gannets, guillemots, razorbills, arctic and boreal ducks) and for spectacular scenery, be it for exploring volcanic areas with geothermal vents, mud pools and geysers, or hiking around glaciers, with their stupendous waterfalls and lagoons. Once you have had your fill, kick back and relax at one of the hot spring resorts, like the famous Blue Lagoon near Reykjavik. Famous people from Iceland include (chronologically): Greenland discoverer Eiríkur Thorvaldsson (Eric the Red), the historian and saga author Snorri Sturluson, the sculptor Einar Jónsson, the Nobel Prize-winning writer Halldór Laxness, and the singer Björk. Occupying the western part of the Snæfellsnes peninsula, 120 km north-west of Reykjavik, Snæfellsjökull is a dramatically shaped 700,000 year-old stratovolcano with a glacier covering its summit. Jules Verne used it as the setting for the entrance to a passage leading to the center of the earth in his famous novel Journey to the Center of the Earth, and the 2008 Hollywood adaptation to the screen was filmed here. 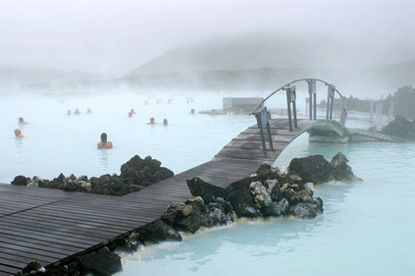 Blue Lagoon is a geothermal spa located 40 km south-west of Reykjavík. It is one of Iceland's most popular attractions, with everything that it implies. Steamy, milky-blue water contrasts with the black lava field. The silica and sulphur rich water is fed from the nearby Svartsengi geothermal power plant at an ideal temperature of 38°C. The spa offers a whole range of treatments and wellness services. At the western end of the Westfjords are the cliffs of Latrabjarg, the world's largest bird breeding ground. The cliffs can reach 440 metres in height (among the highest in Europe) and span over 14 km (8.5 mi). 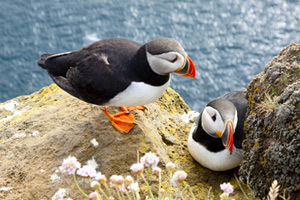 They are home to millions of birds, including puffins, northern gannets, guillemots and razorbills. Built between the ocean and snow-capped mountains, Reykjavik is Iceland's capital and its only sizeable city (pop. 120,000). This is where most of the country's museums, galleries, shops, restaurants and nightclubs are to be found. 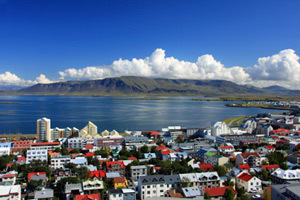 Reykjavik hosts a number of festivals between May and October, including the Reykjavik Arts Festival, the Reykjavik Jazz Festival, the Reykjavik International Film Festival, and Iceland Airwaves. One of Iceland's most spectacular and pituresque waterfalls, dropping 60 metres (200 ft) over the cliffs of the former coastline. 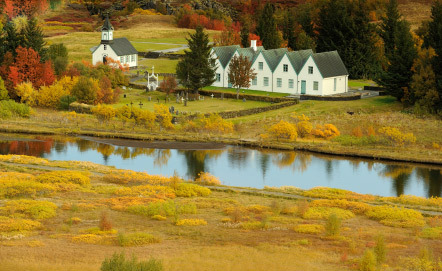 Thingvellir is the original location of the Althing, the world's oldest parliament. Established in 930, it remained on the same site until 1799, when it was discontinued for 45 years, then restored in Reykjavík. 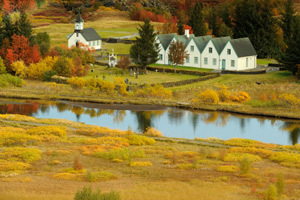 Thingvellir became Iceland's first national park in 1930 and was decreed "a protected national shrine for all Icelanders". It has been a UNESCO World Heritage Site since 2004. 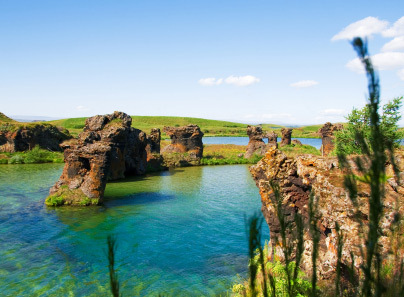 10 km east of the Hekla volcano, the Fjallabak Nature Reserve is a polychromic volcanic region made of rhyolite mountains, lava fields, geothermal vents, lakes and hot springs. It is the starting point of the world renowned Laugavegur trekking route between Landmannalaugar and Skógar via Thórsmörk. Gullfoss is a majestic staircase waterfall in the canyon of Hvítá river. The falls plunge in two stages into a 32 m (105 ft) deep crevice running for 2.5 km perpendicular to the flow of the river. The geothermal field of Haukadalur possess some of the world's most impressive geysers. 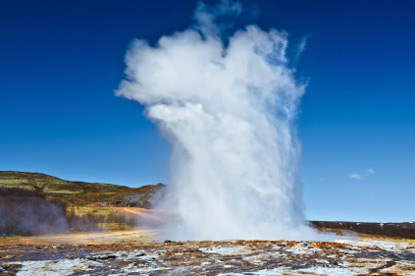 Among them is The Great Geysir, which can sprout boiling water up to 70 metres in the air. It was the first geyser known to modern Europeans and the one after which all the others are named. The other famous one is Strokkur, the world's most reliable geyser, gushing every 4 to 8 minutes. Krafla is a caldera of about 10 km in diameter located in the Mývatn region. 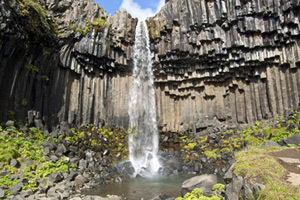 It features a spectacular fissure zone running on 90 km and one of the two best-known Víti ('hell') craters in Iceland. The volcano is still active and has erupted 29 times in recorded history. 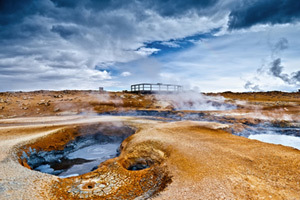 The Krafla area also includes the boiling mudpools and steaming fumaroles of Námafjall and Hverir. Located a dozen km south-west from Krafla volcano, Myvatn is a shallow lake created by a large basaltic lava eruption 2300 years ago. The area has countless pseudocraters, lava pillars, and colourful mudpots. Fed by nutrient-rich springwater, the lake is a haven for all sorts of waterbirds, such as divers, geese and swans. Myvatn has 13 species of ducks from boreal and arctic Europe and North America, including the Barrow's Goldeneye, Tufted Duck, Greater Scaup, and Harlequin Ducks. 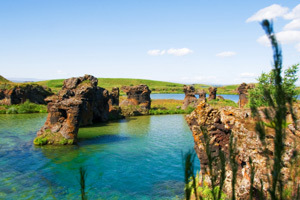 Hot springs lovers will be able to relax at the Myvatn Nature Baths, a smaller version of the Blue Lagoon. 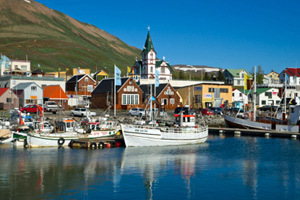 Húsavík is a small, charming fishing town. 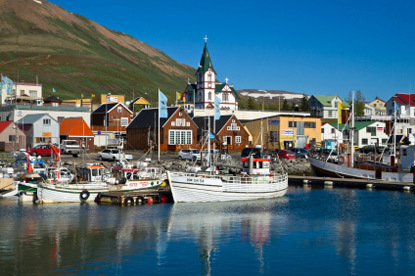 It is Iceland's most famous base to go whale watching. The Whale Museum is an excellent place to learn about the marine mammals before embarking on a boat to see the real life creatures. 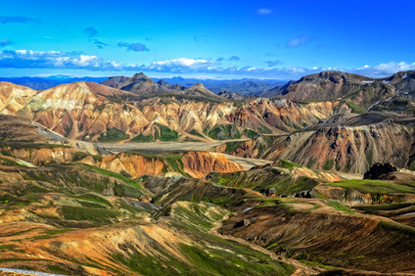 Created in 2008 from the merger of the Skaftafell and Jökulsárgljúfur national parks, Vatnajökull spreads over 13,600 km², making it Europe's second largest national park after Yugyd Va in Russia. The park owes its name to the tremedous glacier at its midst, the largest outside the polar ice caps. The glacier has an average thickness of 500 m and can rise to as much as 950 m.
Lying within Vatnajökull National Park, Dettifoss is the most powerful waterfall in Europe, having an average water flow of 193 m3/s. 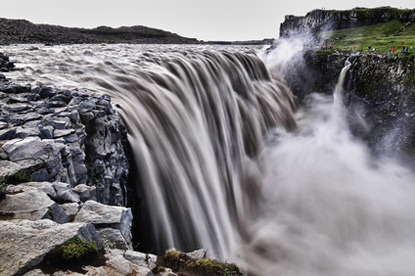 The falls are 100 metres (330 ft) wide and have a drop of 45 metres (150 ft) down to the Jökulsárgljúfur canyon. 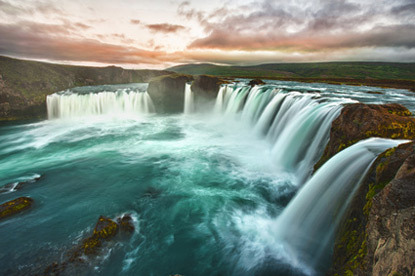 Godafoss, the waterfall of the gods, is Iceland's version of the Niagara Falls - on a smaller scale. 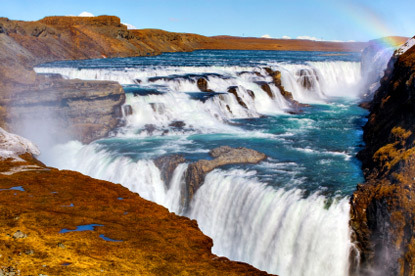 The horseshoe falls are located on the river Skjálfandafljót and drop from a height of 12 meters over a width of 30 meters. 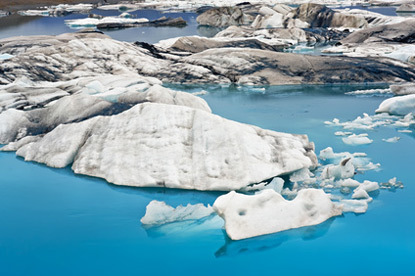 Jökulsárlón is a glacial lagoon situated 1.5 kilometres (0.93 mi) away from the ocean's edge. 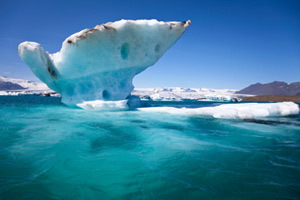 The scene of bluish white icebergs floating on the limpid waters of the lagoon is breathtaking. Fed by the melting Vatna Glacier, the lagoon has increased fourfold in size since the 1970s and is now Iceland's deepest lake, at a depth of 248 metres (814 ft). Jökulsárlón was used as a film set for a number of blockbuster movies, including two James Bond (A View to a Kill and Die Another Day), Tomb Raider and Batman Begins. Meaning 'Black Falls' in Icelandic, Svartifoss owes its name to the black basalt columns of the cliff in the background. The waterfall reaches a height of 25 meters (82 ft).